This book is available now in bookstores. This is an exciting book about an exciting story, t old by one of the activists most involved in it. The book follows the story of New Zealand’s peace movement from 1975 into the 1990s and beyond, and is in many ways a sequel to the earlier Peace People: A history of peace activities in New Zealand, by Elsie Locke. It hardly needs saying that Maire Leadbeater is a daughter of Jack and Elsie Locke, and a sister of Green MP Keith Locke. She was spokesperson for Auckland CND during the peak of the activity described, and her subsequent painstaking research has paid off in the form of an important book, not only about the peace campaigns, but about the way that people in movements can change a country. The prime argument of the book is that New Zealand’s nuclear-free policy was made not by politicians and officials but by a wide-ranging peoples’ movement, and that the policy has become embedded in the nation’s psyche as a result of a long battle won by argument, research and political strategy. Politicians have taken the credit, but they were acting in response to a tremendous groundswell of public opinion, and not out of their own convictions. Or maybe their convictions just needed prompting. As the author says, “If the people lead, the leaders will follow”. This is a comprehensive account of the motivations, the actions, and the personalities involved, and many of the seeming myriad of groups that took part. Throughout the emphasis is strongly on the activity, and not the people themselves. This is an insider’s story, but not an exposé. It is written basically chronologically, clearly and simply with masses of interesting detail. As the book begins the peace movement was small and very much a fringe movement, but it soon became an important player on the political stage. Activism took many forms, from polite letters and petitions to full-on confrontation between warships and kayaks. Organisations of different types formed, grew, and often re-formed in a kaleidoscope of protest. The author mentions that at one point during the 1980s there were more than three hundred groups across the country. The three major campaigns: against the visits by nuclear warships, against French nuclear tests, and to the World Court, are covered in detail. While the bare facts of these events are well-known this book give new insights into the way that the campaigns operated and of the extent that politicians were persuaded to commit, despite their original intentions. Of course the peace movement did not come to an end with the reluctant conversion of David Lange; other issues arose such as self-determination in the Pacific, and US bases in NZ. The book is well produced, and copiously illustrated with photographs, cartoons, and pamphlets. The illustrations alone are worth the price of admission, and great care has been taken with what must be in many cases quick snapshots. I was surprised to learn of the number of scientific advisers and dedicated researchers that worked to give the peace movement a proper factual basis to their arguments, in the face of governmental secrecy and misleading propaganda. Leadbeater argues persuasively that political change has come from a grass-roots political movement without a hierarchical structure rather than from formal processes, and makes it clear that although there have been some wins, there is still work to do. 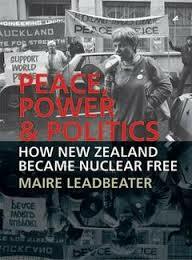 This entry was posted in Book review and tagged clean green nz, david lange, gordon findlay, maire leadbeater, nuclear free, peace power politics by booksellersnz. Bookmark the permalink.